Laser cleaning is a non-contact, non-invasive and not destructive technique which started being used in Restoration worldwide recently, after 1992 along with the first European projects in which it has been employed. 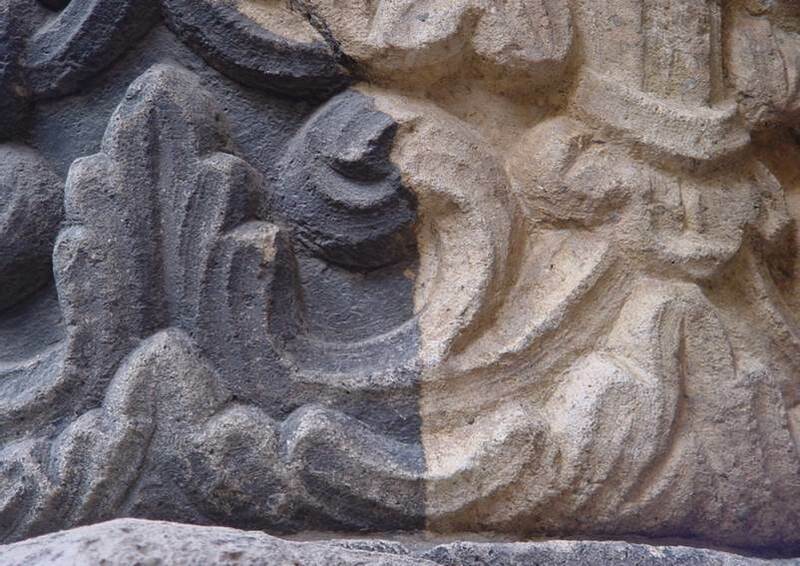 Our team undertook the first laser cleaning interventions in Romania on stone and polychrome surfaces, in 2004 at the Lady's Church and Stavropoleos Monastery both in Bucharest. The remarkable results can still be seen on sites but you can also take a look on this website here or here. For outdoor laser cleaning we are using special designed laser systems with a solid and compact architecture provided with articulated optical arms. The cleaning processes are monitored with a thermo cam in order to demonstrate and validate the non-damaging effects of the used paramaters of the laser beam on the subject surface. The laser cleaning method has been awarded a national patent.